This DIY Foaming Hand Soap recipe is a homemade, non-toxic alternative to keep those messy hands clean. It’s so easy to make and just a few ingredients. You can easily make bottles of this homemade hand soap for pennies compared to store-bought soaps. I used to buy these so-called natural hand soaps from the store thinking I was helping my family. But once I started reading the labels I found that many of the ingredients in hand soaps were loaded with toxic chemicals… even the “natural” ones. And the hand soaps that were clean and organic often cost $5-10 for a 8-10 oz bottle. That’s $30 easily a month to make hand soaps for all 3 of my bathrooms. Add that up over a year and that’s $360. Well, here’s the thing… you can easily make own DIY Foaming Hand Soap for way less money and with just a few simple ingredients. And when I mean way less, I mean like pennies compared to those $5-10 bottles. You could easily make one bottle for like $1 a bottle. So for 3 bottles that’s $3 a month… and $36 a year. Um, compare $36 vs. $360 a year. Which would you rather pay? And the DIY version that’s $36 a year contains all-natural ingredients that you can feel safe about using for your whole family. It really effective on dirty hands, yet it’s gentle and safe – even for little ones. This recipe is so easy to make. It literally takes like 2 minutes to make and BOOM! You’re done. 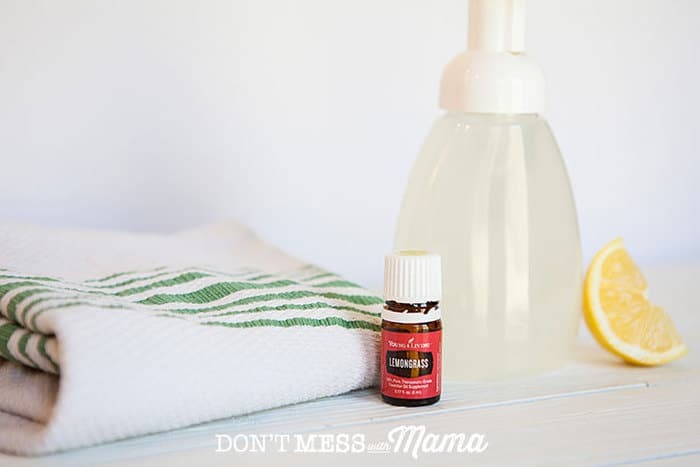 It’s a cheaper alternative to natural store-bought brands, and you can change up the essential oils in this recipe to customize your scent and create seasonal blends For instance, I like Lavender in the spring because it reminds me of spring flowers. In the winter, try Thieves and Orange essential oils for a pumpkin spice scent. For this recipe, I used Lemongrass because it smells so refreshing and clean. Witch hazel helps to keep the water in this hand soap purified so it’ll last about a month. Aloe vera gel is a natural moisturizer and helps to soothe the skin. It works well to disperse essential oils too. Essential oils are used as a natural fragrance and help to soothe and moisturize the skin. 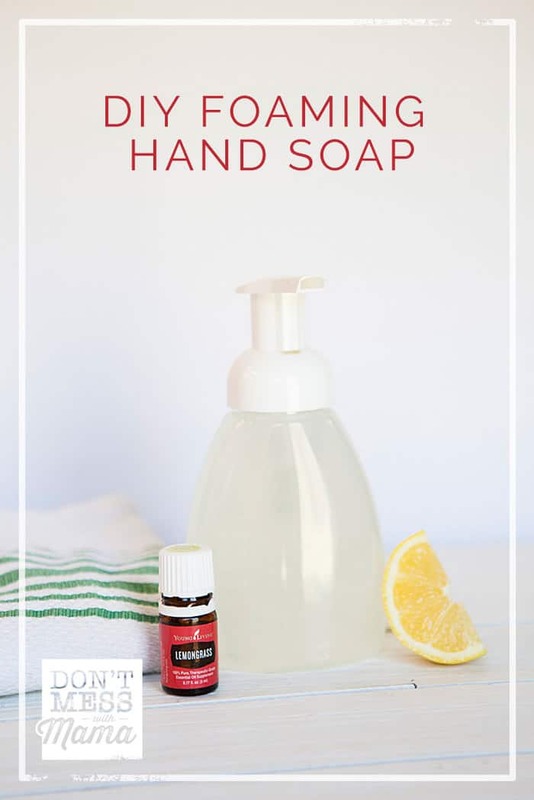 This DIY Foaming Hand Soap recipe is a homemade, non-toxic alternative to keep those messy hands clean. It's so easy to make and just a few ingredients. In a soap dispensing bottle, add water, castile soap, essential oils and aloe vera gel. If you don't have Lemongrass essential oil, try Thieves, Tea Tree, Lemon or Lavender essential oils. Get your essential oils here. This DIY Foaming Hand Soap will keep for about 3-4 weeks as the witch hazel helps to keep the water sanitized. I started using Castile’s Baby Soap a few years ago. I used it for regular hand washing and also tried making wet wipes for personal hygiene, I was a little concerned because I did not have a recipe. Do you have one? I was pleased, I am the only one in household that uses it regularly. I had a bottle that was half full. I had it awhile and I was concerned if it may be contaminated . I tried looking for the expiration date. I could not find it. How long can it be kept? . I may have just overlooked it. Can you tell me if it has an expiration date? While I have you now, how long should make-up be used? I saw a television show, (The Doctors), They said you can send your old make-up to some companies and they will pay you for it and it is recycled and perfectly usable. I do have a wipes recipe here: https://dontmesswithmama.com/how-to-make-homemade-baby-wipes. For this recipe and the hand soap, ideally you do want to use within 2-3 weeks. They are not meant to have a long shelf life so it’s better to make smaller batches. Hope that helps. Do you have a recipe for liquid hand soap instead of foaming? Or can I make the same recipe and use a regular pump? This recipe is too watery for a liquid hand soap. I would do a 2:1 (castile soap to water) mixture and add essential oils to that. Give it a try and tell me how it goes. I do about 1/4 to 1/3 of the container with castile soap and fill the rest with water – and then add essential oils.